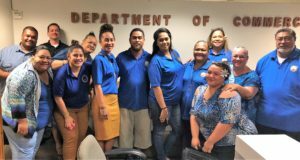 INSPIRE’s March “Wear All Blue” Colorectal Cancer Awareness – DAY 2, Friday, March 2, 2018 is with the American Samoa Department of Commerce staff members. The American Samoa Department of Commerce’s mission is to improve the quality of life for individuals and communities through economic development and sustainable resource management. DOC Director: Keniseli Lafaele, Deputy Director: Sandra Fuimaono-Lutu and Deputy Director: Uili Leauanae. Visit their website at HTTP://doc.as.gov/ to learn about the services they provide. Thank you DOC for supporting INSPIRE’s ‘wear all blue’ campaign in promoting CRC awareness in American Samoa.